Learning about water conservation is an important subject, and to make it more enjoyable and effective, each student can create a beaded key chain or bracelet. This is great for any general education teacher, science teacher, or for classroom activities, kids camps and library programs. Gold Pony Bead - You - Because… Water Use Efficiency begins and ends with YOU!! In our examples pictured below, each pony bead is strung in the order listed above. 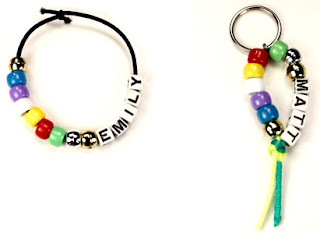 Personalize your key chain or bracelet by using alphabet beads and add your name after the last gold bead. Your name in the bracelet or key chain will serve as a reminder that YOU are part of the cycle of water conservation. If you would like to use this activity in your classroom, bead kits can be purchased at Bead Bee, click here for bracelet kits, click here for keychain kits, or give us a call at 407. 895. 0062. Thank you to my friend Malea at the Eastern Municipal Water District in Perris, CA for sharing this idea.